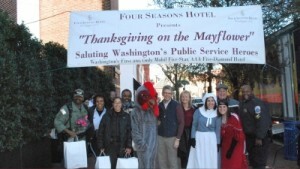 For the 17th consecutive year, Four Seasons Hotel Washington, DC will once again host its annual holiday tradition, Thanksgiving on the Mayflower. The event gives thanks and gives back to those that loyally serve the local community, including on major holidays. Police officers, fire fighters, emergency medical responders, hospital workers, park police and other public servants working on Thanksgiving Day, November 24, 2016, are invited from 11:00 am to 2:00 pm to enjoy a traditional Thanksgiving feast. Hotel staff volunteers including General Manager David Bernand and Hotel Manager Kelley Moreton will welcome diners dressed in traditional pilgrim garments and assorted costumes, including a Pocahontas and a turkey. More than 30 Hotel employees and their family members will graciously donate their time to serve more than 350 Thanksgiving meals and approximately 150 to-go meals to beloved public servants working on Thanksgiving Day.